I had no issues installing the rear springs but I've run into a snag on the front. I have a Wilmart style spring compressor (see pic below) and I compressed the spring as far as it seems reasonable to do but I still need another 2" before the shock stem is far enough to get the nut on. I noticed when I removed the nut there was still some stored energy and I now realize the shock stem retracted about 1 5/8" after the nut was removed. Is this normal or are these shocks toast? I was hoping to reuse these since I've read so much conflicting info on Koni Yellow vs. FSD but I might have to go ahead if they won't have this issue. I don't see any way to pull that stem out while trying to put this back together so I'm wondering if I need a better spring compressor to finish this job? 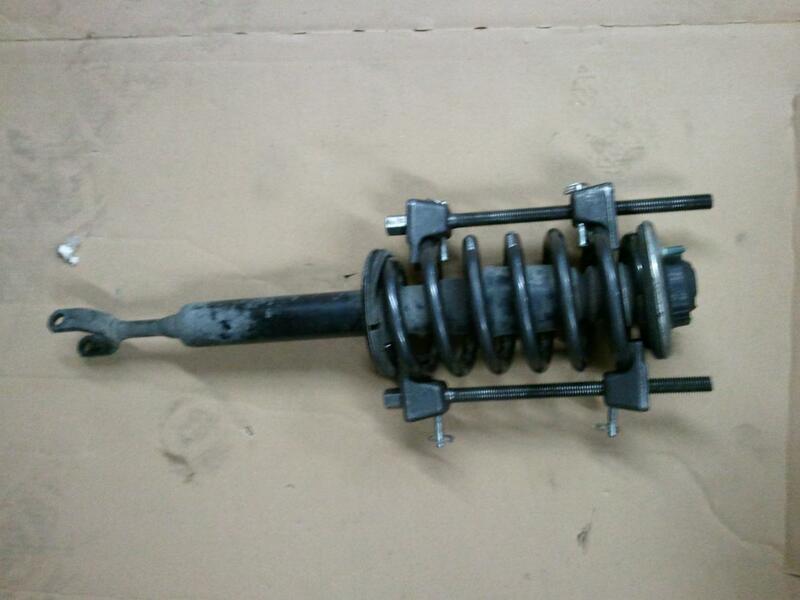 Also, the factory front springs have a nice flat area at the top and bottom where the last coil goes horizontal but these Pro springs keep inclining all the way until they stop. Sound right? 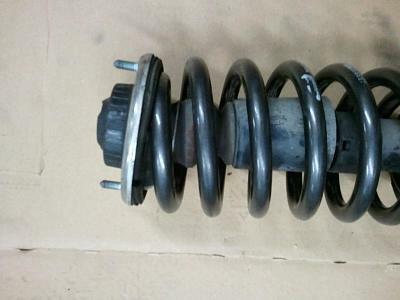 I tried to verify the spring part number but I can only find the kit number (1580.140) not the individual spring number. I went by Advance and got their loaner compressor and I was able to make it happen after that. I had to compress it until the coils were about 3/8" from each other. I still don't like how the perches sit on these Eibach springs (see pic below) but after putting some weight on it the top plate straightened up and I was able to tighten the upper nuts without issue. Now I'm waiting on some control arms since every bushing under this thing was in two pieces then we'll see what this thing is made of. WTB: Front and Rear B5 S4 struts with springs.